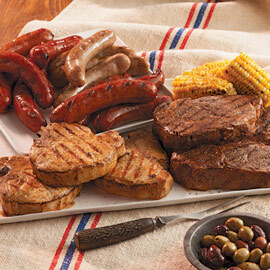 The generous Amana Sampler is loaded with some of our most popular delicacies. 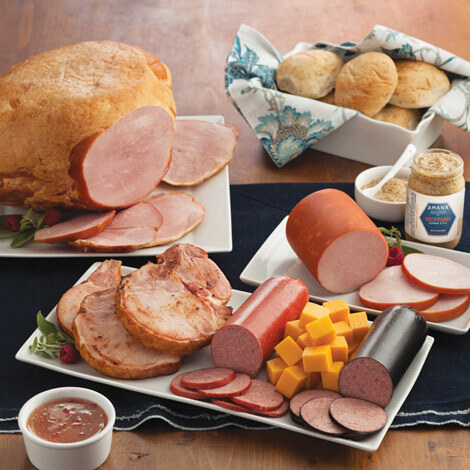 You can sample everything from ham, chops and sausages to cheese, condiments and more! 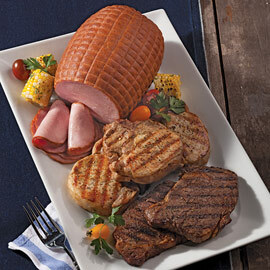 Ham is excellent,Pork Chops can be cut with a fork! Smoked summer sausage is excellent! Amana Response: Danny, We are so sorry to hear about your brother - sending our thoughts and prayers. We normally do ship the same day on a Monday if it comes in as early as you ordered, but we were having a very hot spell here in Iowa and since we were shipping to Mississippi, we felt it was better to hold it until the next day when we could include a piece of dry ice with the order. Had we known you were hoping to have it by Wednesday, we would have figured out another way to get it there safely on Wednesday the 12th for you. We have a special instructions/comments section in check out that we look for special shipping instructions like that in. Again, sorry to have disappointed you and our condolences to you and your family. This was sent to my parents as a Christmas gift and they absolutely loved it! I also added the pepper bacon - great idea!! I will definitely order this again. My friend seemed to be thrilled with the package from Amana. Will order from them again. I was very satisfied with my purchase and the speed with which it was delivered. I was told the food was delicious and that the ham was the best they've ever had. This is the first time I had ham from Amana. It was the best ham I have ate, my family enjoyed it also. 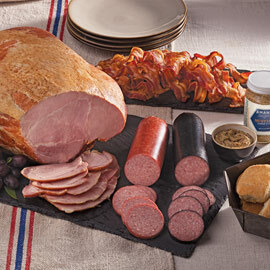 For help and tips on preparing the Whole Bone In Ham, see our Cooking & Serving Instructions.